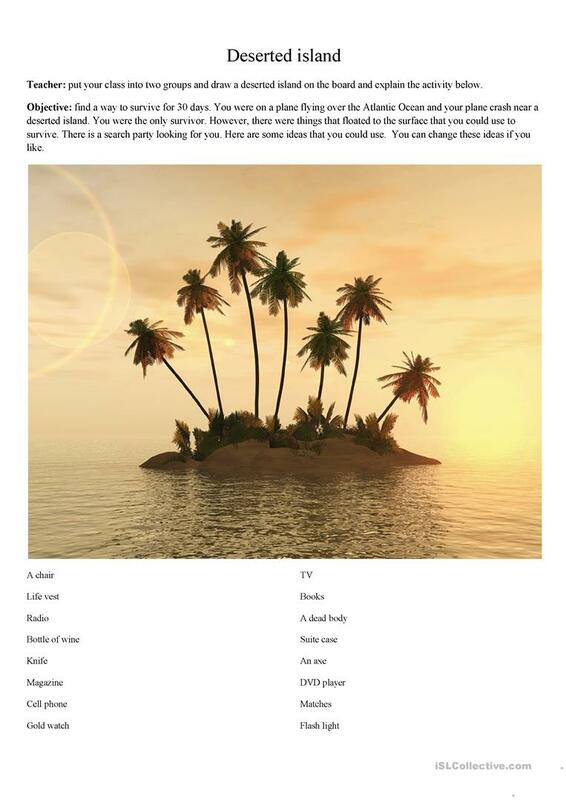 Try to survive for 30 days on a deserted Island. This downloadable worksheet was created for business/professional students, high school students and adults at Pre-intermediate (A2), Intermediate (B1) and Upper-intermediate (B2) level. It is a valuable material for enhancing your pupils' Listening and Speaking skills. It is focused on the vocabulary topic of Debate. You will find the answers at the end of the worksheet. Profe2 is from/lives in Colombia and has been a member of iSLCollective since 2012-08-18 05:22:54. Profe2 last logged in on 2019-04-16 21:57:52, and has shared 15 resources on iSLCollective so far.